By Alvaris Falcon in Artwork. Updated on November 19, 2017 . Reality can be a bore sometimes, which is why most of us are grateful for the creative sparks generated by artists like Victor Nunes. 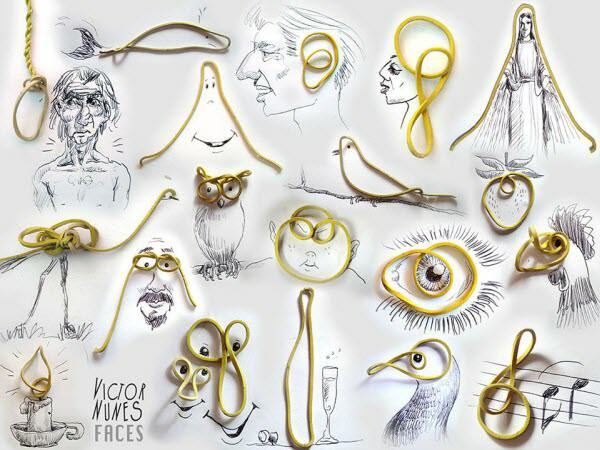 Nunes stretches his imagination, and yours, turning everyday objects like pen caps, biscuits and rubber bands into caricatures of life – well, part of it, at least. As an expert on creativity, Victor Nunes has been mashing 2D drawings on paper, together with common, everyday objects to give it a twist. Here we’ve selected 12 of them to show you what we mean, and how fun things can be when imagination comes to the surface. Rubber Band. The is a perfect first example to showcase the artist’s capability – he can bend the rubber bands and his creative nerves to make all sorts of playful art (except for the noose, of course). Bottle Cap. 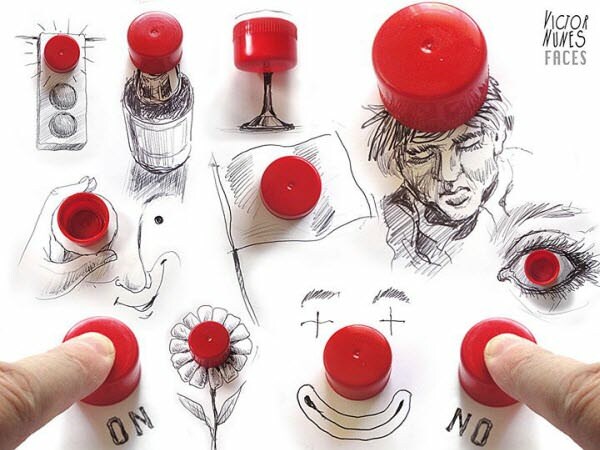 To have fun with everyday objects, you just need to imagine all of the potential functions of it, like how a simple red bottle cap can be turned into an ON button. Cork Plug. 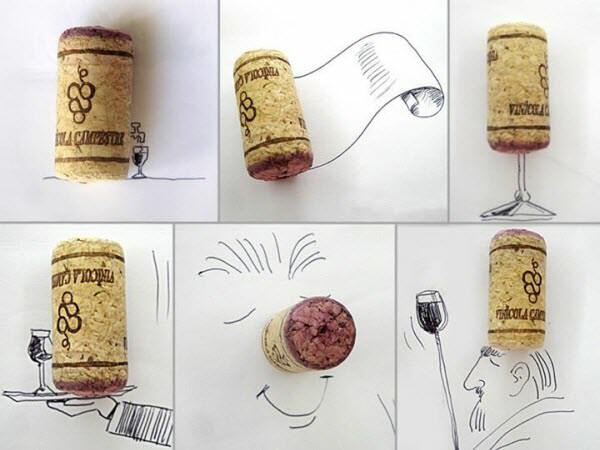 What can make with a cork plug? Apparently, a lot of wine-related creative mash-ups. Pen Cap. 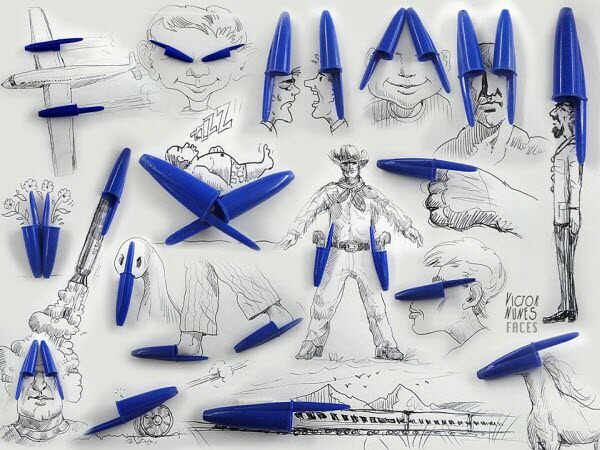 Next time you are bored in class, maybe try to make have some fun with your pen caps. Here are a few ideas. Razor. 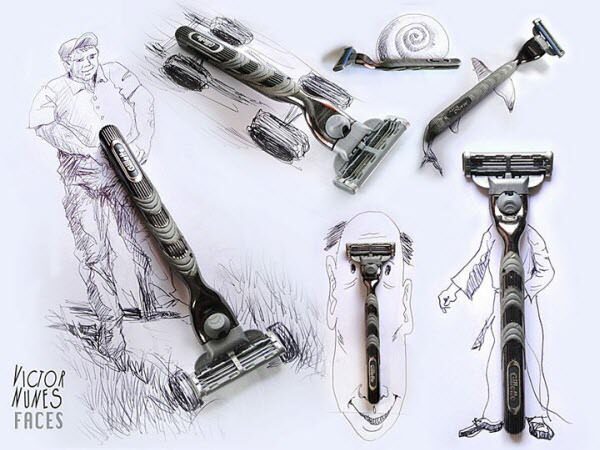 Isn’t it impressive how the artist can come up with both a cool racer and a snail using the same razor? Clothespin. 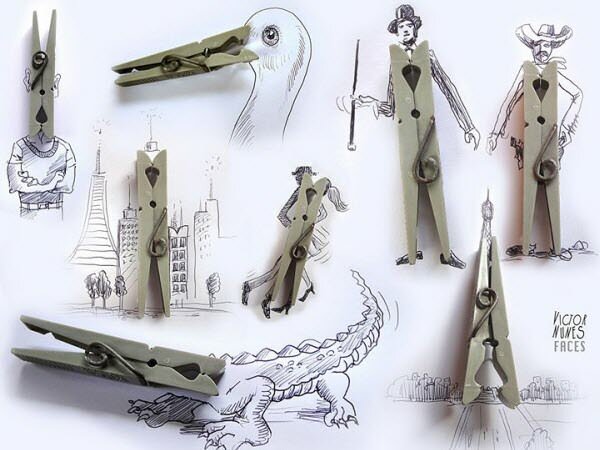 Turn a regular clothespin into a duck bill or a crocodile, or more. Popcorn. 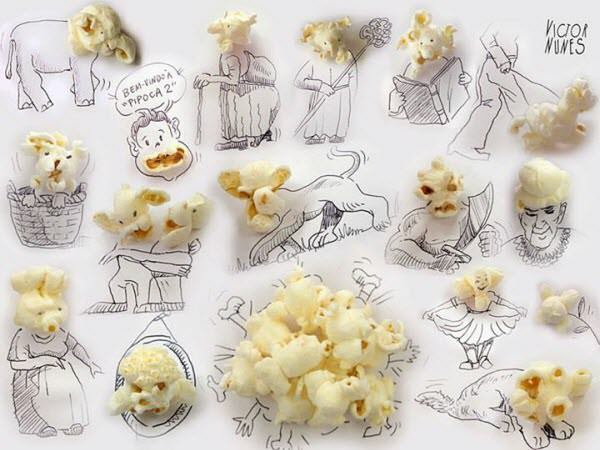 Think popcorn is too random to be turned into art? Who would have thought popcorn can be turned into faces. Check these out. Dried Apricot. 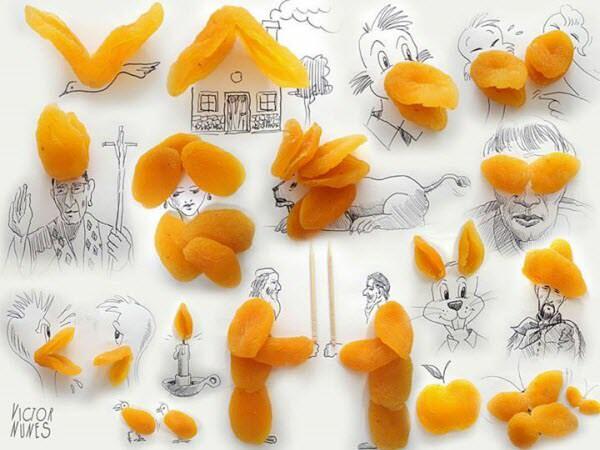 Never expected to see so many drawings made with dried apricots in my life. Talk about boundless imagination! 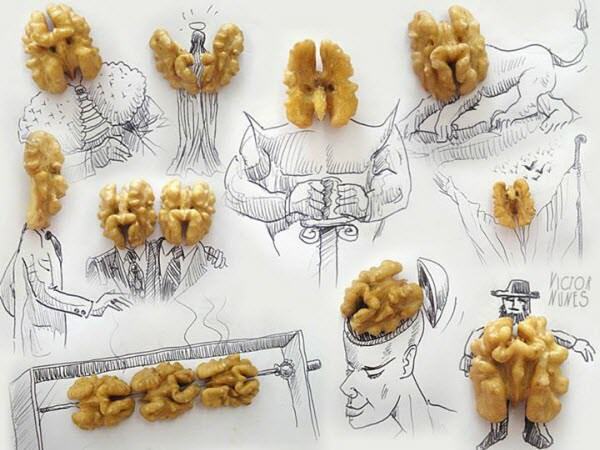 Walnut. A personal favorite, as they fit the artworks almost perfectly. Particularly the BBQ chicken. Yummy! Breadstick. 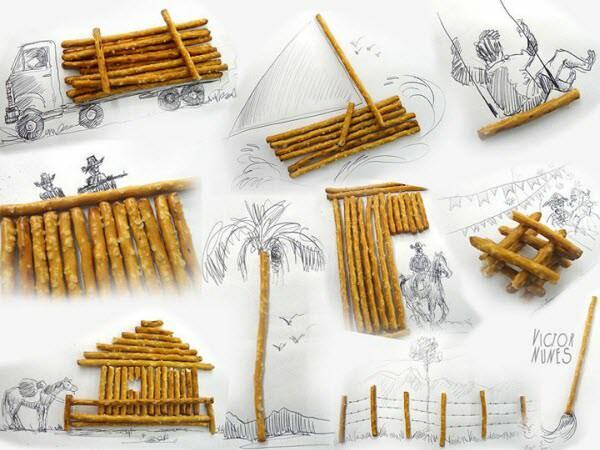 Now you see the artist’s trick – think of the breadstick as part of bigger entity. Biscuit. 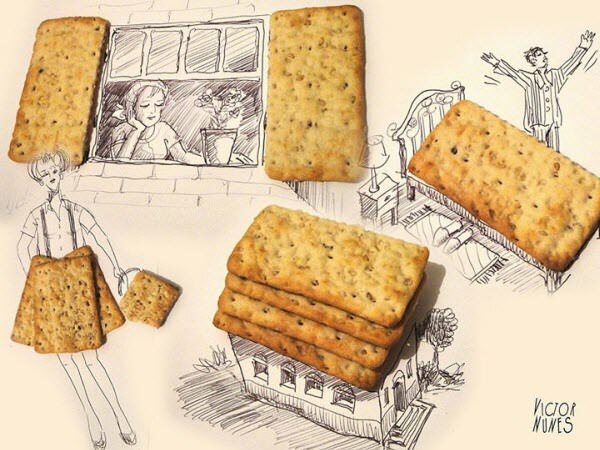 Proof that you can play with your food (that’s right, mom) and there’s nothing wrong with it. Chips. 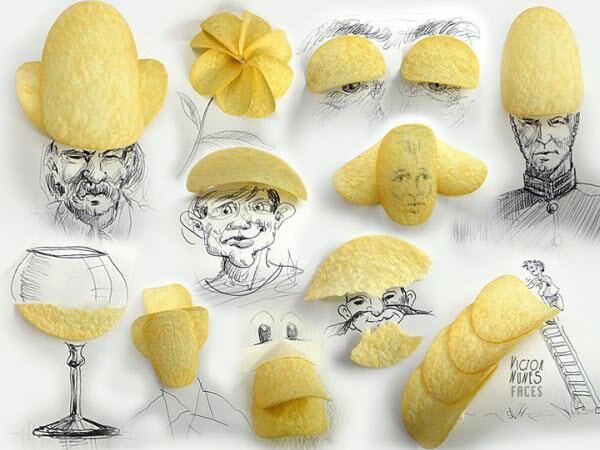 You cannot unsee chips for what they can be now. Is that a face on the potato chip? Wait, that’s all? Probably not, as Victor Nunes has more coming out in his Facebook album, so visit it any time you want to have fun with everyday objects and food!